Advanced Dental Care is proud to be a certified Invisalign orthodontics provider in Costa Mesa, CA, serving teenaged and adult patients in Irvine, Newport Beach, Anaheim, Huntington Beach and the surrounding communities in Orange County. No longer do you have to suffer through years of painful, unattractive metal braces! 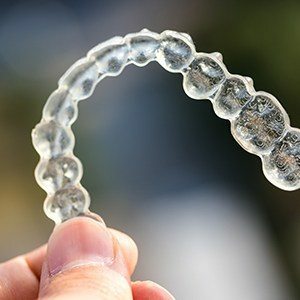 Why Choose Advanced Dental Care for Invisalign® Clear Braces? If you are in need of orthodontics to correct crooked teeth and/or an improper bite, Invisalign is a speedy solution. Most Invisalign regimens take between 12 and 18 months, whereas traditional metal orthodontia treatments can last for two years or more. Some Invisalign plans for especially minor issues can be completed in as little as three months. Invisalign is faster and less painful than metal bracket braces while being just as effective for minor orthodontic problems. Since Invisalign aligners are removable, it’s much easier for patients to maintain good oral hygiene routines – plaque, bacteria, and food debris are often difficult to remove from the nooks and crannies of metal orthodontia. Your aligners can be cleaned using a special Invisalign branded cleaning kit or with denture cleaner. Invisalign is approved for adults and teenagers who have fully erupted, permanent teeth with no major skeletal malocclusions, severely rotated teeth, multiple missing teeth, or open bites that need to be closed. If you have any of these issues, traditional orthodontia may be a better path towards dental health for you. Advanced Dental Care is happy to consult with you to see how we can best meet your orthodontic needs. A computer-generated 3D mold of your teeth is taken at Advanced Dental Care that maps out the current state of your teeth and the projected final smile makeover. A series of 20 to 30 aligners are custom made for you at Align Technologies lab using CAD/CAM equipment. The clear, thin plastic aligners are worn over the teeth for at least 20 hours a day for about one year. You will switch to a new, tighter aligner about every two weeks. Dr. Jorgenson will distribute new aligners to you at follow-up appointments every four to six weeks. Each aligner moves the teeth in small increments, ranging from .25 to .33 millimeters. Advanced Dental Concepts will work with you to create a personalized Invisalign treatment plan that suits your needs, budget, and insurance plan. We pride ourselves on providing you with the friendliest, most relaxing dentistry in Orange County and only use cutting-edge dental technologies to ensure comfortable, long lasting results. Call us today to schedule an Invisalign consultation!